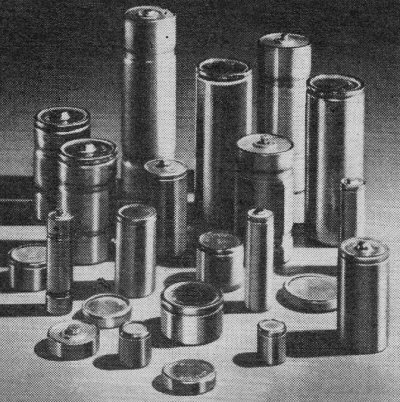 In the early 1960s, nickel-cadmium (NiCad or NiCd) batteries were the way of the future due to a combination of high charge storage density and recharging ability. Carbon-zinc (C-Zn) cells were well established by then and had performed reliably during World War II and in Korea. Alkaline batteries were considered the de facto high standard for critical applications that required longer life and higher current than C-Zn could supply, but were (and still are) considerably more expensive. Mercury cells exhibited a fairly constant voltage level during useful life, which made them preferable for applications with a low voltage variance tolerance. 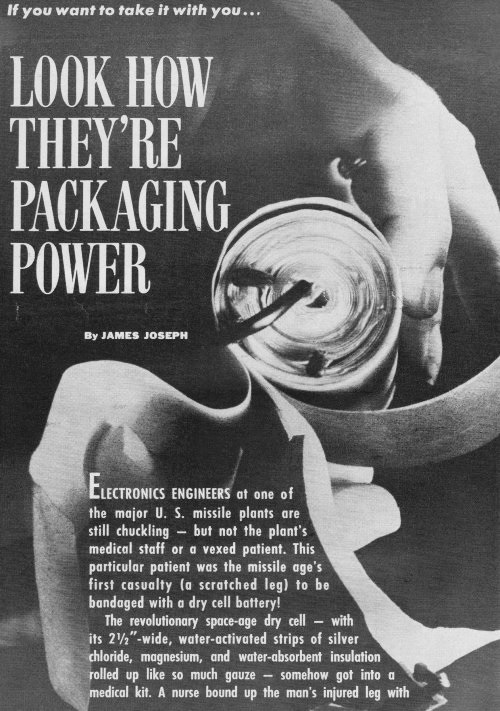 Lithium-ion (Li-Ion) cells, those things that rule today's battery domain, were not much more than a laboratory curiosity at the time. This article provides a good bit of history and characteristic descriptions of cell chemistries. Electronics Engineers at one of the major U.S. missile pants are still chuckling - but not the plant's medical staff or a vexed patient. This particular patient was the missile age's first casualty (a scratched leg) to be bandaged with a dry cell battery! The revolutionary space-age dry cell - with its 2 1/2"-wide, water-activated strips of silver chloride, magnesium, and water-absorbent insulation rolled up like so much gauze - somehow got into a medical kit. A nurse bound up the man's injured leg with what amounted to 6 volts and $25.00 worth of "electrical gauze" - before discovering her error. - A new magnesium cell (1.5 volts) licks sub-zero temperatures, which once doomed dry cells to quick death. Magnesium generates both heat and electricity, keeps the battery's innards warm (and operating) as low as -65°F. Result: now you can operate portable equipment in winter's chill, or at frigid, high altitudes. - Stackable "wafer" cells - the nickel-cadmium rechargeable type - let you build your own power package to fit almost any transistorized project. Four silver-wax-terminated 1.25-volt d.c. wafers can be stacked one atop another (connected in series) merely by pressing their waxy terminals together. Result: a 5-volt battery scarcely larger than a pencil's eraser. - New solid-state batteries of the silver-vanadium pentoxide type (high-voltage, low-current cells) pack 95 volts in a 1"-long, 1/2"-diameter true "dry" cell - its solid electrolyte is bone dry, can't freeze. One application: a miniature "polarization" source for electrostatic speakers. - Snap-together cells for transistor circuits are among the newest power "building blocks": snap two 3-volters together in series, and you've got 6 volts for your low-current project. Snap-together cells by Burgess rated at 3 volts, let the experimenter make up non-standard power packs with taps for transistor projects. Carbon-zinc "wafers" rated at 1.5 volts, are stacked by the same manufacturer in leak-proof tubes for use in radios, hearing aids and other portable devices. High-rate rechargeable nickel-cadmium cell battery by Eveready (above, left) provides power punch for cordless drills and hedge trimmers. 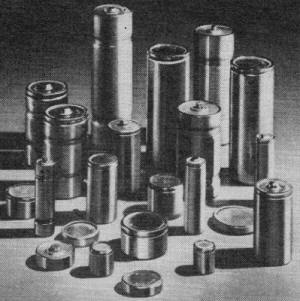 The Sonotone D-size nickel-cadmium cell (center), rated at 1.25 volts, is designed for constant output at temperatures from -40° F to +160° F. Button-cell construction with nickel-cadmium "innards" by Burgess (right) permits stacking cells for home-brew projects . "All of which," grimaces one home experimenter, "merely adds to the confusion ... what with more than 2000 dry cells, big and small, now available." Actually, it shouldn't. 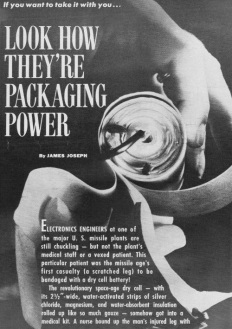 Despite new packaging (most of it miniaturized) and exotic innards, the electrochemistry of dry batteries - which is what makes them work - hasn't changed much since George Leclanche's carbon-zinc cell (the 1868 "grandaddy" of the common flashlight "D" cell). In fact, no radical changes have been made since about 250 B.C., when the Baghdad goldsmiths electroplated jewelry - including some of Cleopatra's - with copper-iron batteries. So, let's talk about "dry" cells, most of whose conductive electrolyte isn't really dry but rather a wetted paste. Then and Now. The basis for all batteries is galvanic action - electricity generated by chemical interaction between two dissimilar elements (typically, a carbon and a zinc plate) separated by a chemical conductor (an electrolyte). Connect the carbon and zinc plates externally, and an electrical current flows. Inside the battery, current flows to the positive plate (carbon) from the negative plate (zinc). As it does, the zinc plate is gradually consumed. Such simple chemistry produces, at best, about 1.5 volts. But simple as it is, the basic cell is a chemical maverick. Hydrogen bubbles formed in the chemical process film the positive plate, blocking current flow. So engineers have to devise complex (and often secret-formula) electrolytes which also act as "depolarizers" - chemical "sponges" which soak up or absorb the hydrogen bubbles, unblocking current flow. One such depolarizer is manganese dioxide (artificial manganese is generally used, but its absorbent purpose is the same). - Pill-sized nickel-cadmium cells that you can recharge upwards of 500 times. - Alkaline midgets with nearly 10 times the life of carbon-zinc batteries-and which, unlike the latter, let you all but drain them of their stored energy before their voltage falls below circuit-operat­ing minimum (the so-called "cutoff point"). - Reserve" cells which lie dormant (you can store them for five years or more), don't perk up or put out voltage until dunked in water; they're ideal for emergency transmitters, alarms, or signal devices. For every circuit and application, there's a just-right battery size, shape, weight, and volt-ampere life rating. The trick's in knowing which battery when - and why. Carbon-Zinc Cells. 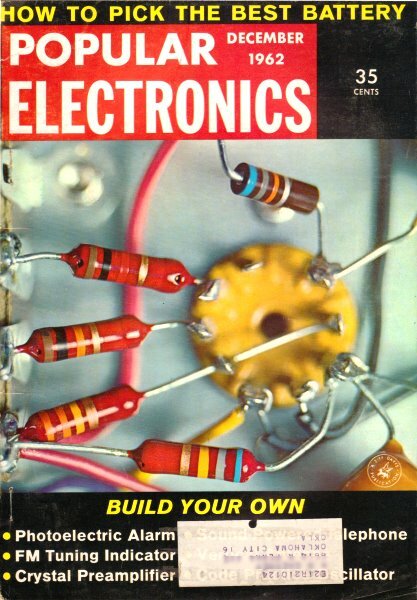 The low-cost, nominal 1.5-volt "traditionals" now come packaged not only in conventional shapes (1 1/2 to about 22 1/2 volts, cylindrical; up to 510 volts, rectangular, in multi-cell packs), but also as flat, midget-sized, and bantam-weight "buttons" and "wafers." The smallest "buttons" (less than 1/4" in diameter) weigh only a quarter of an ounce, yet pack 1 1/2 volts. Some factory-stacked (and packaged) wafer-celled batteries range to 22 1/2 volts. 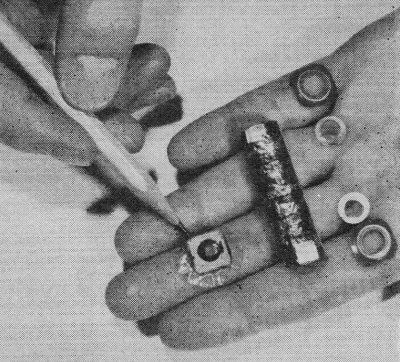 One husky 13.5-volter (Burgess's PM9 transistor "activator") weighs a mere 2 1/2 ounces and is a veritable midget power plant for transistor circuits. Burgess's new rectangular wafers (their corners are slightly rounded) sandwich an artificial manganese dioxide mix between flat discs of carbon and zinc. The sealed sandwich is wrapped in pliofilm. A spot of silver wax on the cell's negative and positive sides provides perfect "wireless" contact, for stacking. Stacked cells (as many as nine to a stack) are wrapped in Mylar insulating film and packaged as round or rectangular dry cells of from 3 to 13.5 volts. 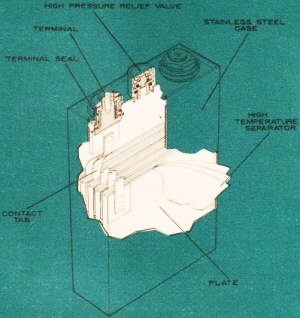 A typical wafer (such as the Burgess 1 1/2-ounce "K" cell, which is 1 1/4" long, less than 1" wide", can deliver 15 milliamperes for about 14 hours before the cell's nominal 1.5 volts falls to about 0.9 volt, beyond which most circuits won't operate. 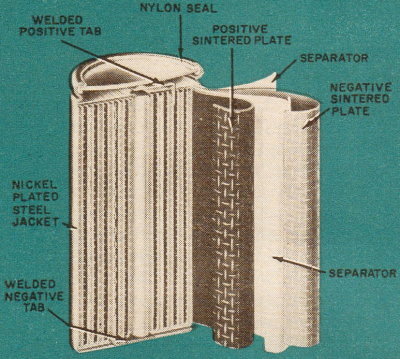 Eveready's new carbon-zinc "cathodic envelope" cell for transistorized portable circuits sandwiches the negative zinc plate between two flat cakes of de polarizer mix. . Encasing this "anode sandwich," and bonded to a plastic envelope sealing the cell, is the cathode collector - a special carbon-impregnated, current-conducting film of plastic and metal foil. Result: greater power, since the electro-chemical reaction takes place from both sides of the sandwiched zinc anode. A typical 6-volt "cathodic envelope" (such as Eveready's 2713) weighs only four ounces, and is rated at 140 service hours with a 15-ma. drain. Carbon-zinc cells, however, have a common failing: their voltage output constantly decreases with current drain. By contrast, some newer dry cells (the alkaline and rechargeable nickel-cadmium types, for example) hold their rated voltage until almost the end of the cell's life span. 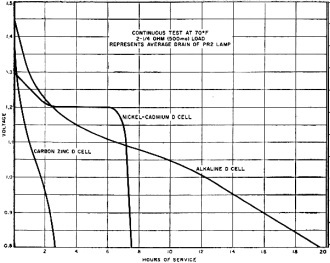 Comparison of service lives for three dry cell types under relatively high current drain typical of a flashlight battery in continuous operation. According to a well-known dry cell engineer, "you've got to fit your circuit to a just-right battery - and that goes double if it's a carbon-zinc cell you're figuring on as your power source." 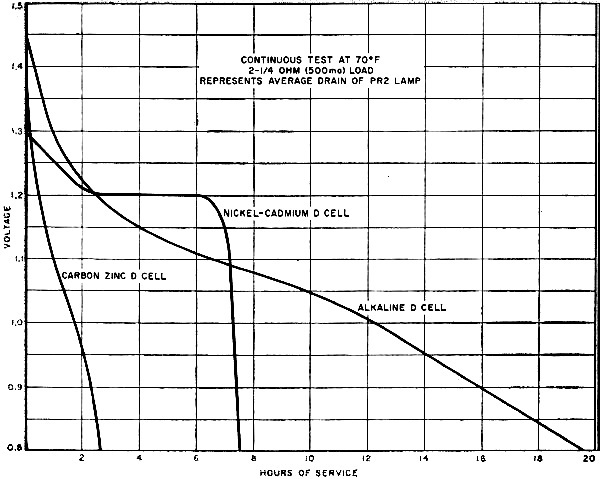 A typical "life" curve for a carbon-zinc "D" cell (see graph at right) shows why. Carbon-zinc voltage falls with every milliamp you draw from it ... and also with temperature. As the graph indicates, if your circuit is drawing 500 ma., this particular cell's output falls below your circuit's "cutoff" voltage just short of 3 hours of continuous battery use. If, on the other hand, your circuit draws only 2.5 ma., the cell will operate nearly 70 hours before exhaustion. Obviously, you'll need a battery with longer than a 3-hour life for a 500-ma. circuit. But, for a 2.5-ma. drain, this battery might prove the ideal (and economical) portable power package for you. See the difference? Just "any" dry cell won't do. Mercury Cells. So named because their positive electrode is mercuric oxide mixed with a conductive material, mercury cells are both more expensive (but not much) and heavier (considerably) than carbon-zinc cells. Offsetting the slightly lower initial voltage of the mercury cells (1.35 volts compared to 1.5 for the carbon-zinc type) is their relatively constant voltage output over much of their service life. You start with less initial voltage, but actually get out more sustained power. In fact, about 80% of a mercury cell's electrical capacity is drained before the "cutoff" is reached, at about 0.9 volt. 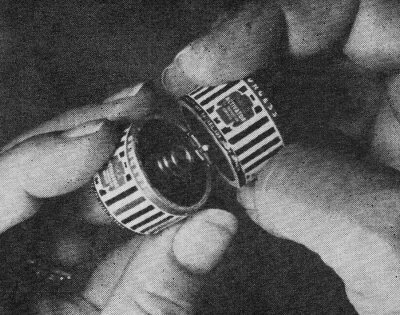 One of the smallest mercury "activators" is Burgess's "button" Hg-312-a tiny, 1/3"-dia., steel-encased cell (steel casing is ideal where voltage regulation is important). This power-mite's service life is calculated at 36 ma. hours at a drain of 2 ma. New dry cell shapes and sizes call for new packaging techniques. Cylindrical cells are rolled together. High-current cells require unusual construction to ward off effects of high temperatures and pressures; both of these units are made by Sonotone. 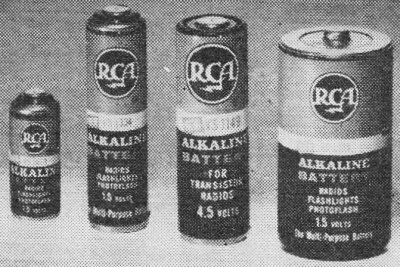 And although the RCA alkaline cells above look like ordinary flashlight batteries, they will outperform common carbon-zinc units. A mercury cell has two major disadvantages. It's non-rechargeable and a poor performer at even moderately chill temperatures; below 40°F the cell goes dormant (it operates best between 70° and 113°F). And at higher temperatures, the cell's electrolyte gives off gas; exposed to direct heat, it may explode. Alkaline Cells. Packing high current output in a mite-sized package, an alkaline cell provides amps when your portable circuit needs them. The cell's alkaline-manganese positive plate, dioxide-zinc anode, and potassium hydroxide electrolyte combine to give a low internal impedance, resulting in a high current output. Some designers claim the alkaline cell has 8 to 10 times the life of conventional carbon-zinc cells under heavy loads. The high-current surge output of the alkaline cell (up to 8 amps for 8 seconds in some electronic photoflash applications) makes it suitable for heavy "hobby-craft" chores (powering model boats, igniting model plane "glo-plugs," cranking motion picture cameras). Common electronic usage sees some alkaline cells with starting drains upwards of 6500 ma. Draw 200 ma. at 70°F, and the alkaline cell is still putting out power enough to operate your circuit after five or six hours. By contrast, a carbon-zinc cell under the same walloping load gives less than one hour's service. But the alkaline cells, which cost about three times as much as the carbon-zincs, are less economical where current drains are low or intermittent, or both. The spanking new 1 1/2-volt VS1336 standard "D" alkaline cell made by RCA can handle currents up to 1 ampere. It's a "comer" for powering radios, photo-flash circuitry, toys, and high-current instruments. Eveready's No. 560 7.5-volt alkaline battery can be recharged and reused many times. Although the recharging conditions are exacting, this battery is finding popular usage in Citizens Band transceivers. Alkaline cells also perform far better at low temperatures than carbon-zinc types. ,At -20°F, a typical carbon-zinc draining 10 ma. has an operative life span of only about 40 minutes. An alkaline cell, under the same conditions, would be good for almost another hour. Nickel-Cadmium Cells. You can sum up this type of cell in four words: rechargeable ... expensive ... worth it. The nickel-cadmium cell (its positive electrode is nickel; its negative electrode, cadmium) is a "secondary" cell - meaning "rechargeable." It's akin to your car's storage battery (also a rechargeable "secondary" cell) except that you don't have to add water to the sealed ni-cad. Plug the cell into a recharger, and it's back to full charge - 1.25 volts d.c. - in from 14 to 16 hours. Some ni-cads can be recharged 500 to 1000 times. Once limited to low-current drains, ni-cads now come packaged to fit most home projects and most current drains. Burgess's ni-cad line ranges from its "button" CD1 cell, rated at 1.25 volts and 20 ma. hours, to its standard rectangular CD111 cell, rated at 1.25 volts for 23 amp hours. Nickel-cadmiums start with lower full-up voltage (1.25 to 1.3 volts) than the carbon-zincs, but their discharge curve is essentially flat. This means that you can pull more power out of them for a longer time before they have to be recharged, usually when the cell charge falls to about 1.1 volt. Sonotone's new midget S126 (about 1/2" diameter) powers pocket paging systems, electric timers, miniaturized alarm circuits and, drawing 25 ma., falls to 1.1 volt "cutoff" after about 6 1/2 hours of use. Draw four times the current - 100 ma. - and the cell's good, before recharge, for about 75 minutes. The main disadvantage of nickel-cadmium cells is that excessively low or high temperatures sap their vigor, and may cause leakage. Their best operational range is between 0°F and 115°F. At 0°F, a typical ni-cad has only 60% of its capacity at an operational-normal of 70°F. And the ni-cads are expensive, their "first costs" being enough to scare most workbenchers. Whereas the common carbon-zinc flashlight "D" cell might cost 15 cents, the ni-cad "D" is liable to be tagged $2.75 ... a kindred mercury cell, 75 cents ... and an alkaline cell, 50 cents. But if you keep recharging and reusing the ni-cad, in the long power-pull you'll get more volts for less money than with any other dry cell, past or present. 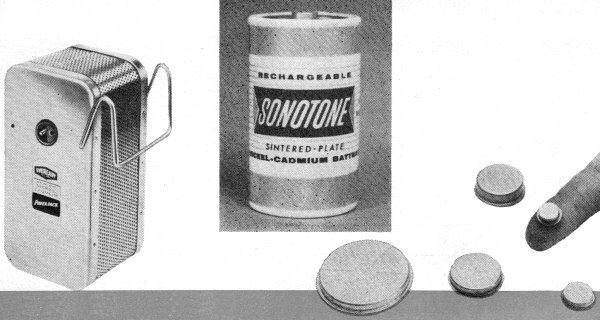 These nickel-cadmium dry cells by Sonotone provide portable power in many sizes, shapes, and voltages. "Reserve" Cells. "Whamo" is the word here - for cells which, though "dry," don't produce power until they're activated by water. But the power that they give is the uppercut kind - a jolting, short-lived jab that fires up emergency transmitters, jolts a missile on course - or can trigger your special "one-shot" projects. The "reserve" dry cell is just that - power held in reserve until needed. Most of these cells are built around either the cuprous chloride-magnesium system (and are called "cuprous chloride" cells), or silver chloride and magnesium ("silver chloride" cells). To activate them, you dunk them in water - any kind that's available. Ten-seconds wetting is often enough to fire them up. Some "reserve" cells, many custom-designed for military electronics, deliver up to 30 watts per cubic inch! One new cell no larger than a flashlight battery whacks out 100 amperes. Voltages (figured as "peak voltage") range from 1.52 to 1.60 volts per cell. But output - when it comes - is short-lived, expended in a matter of minutes. One big advantage of the water-activated cells is that, once wetted, they operate almost as efficiently (considering their short-duration power punch) at -80°F as at a fiery 185°F. Dry cells? Ironically, the electronic age's only bone-dry cell must be wetted to work. Still, you can pick and power from at least 2000 not really "dry" cells. Designed to deliver dependable volts, they provide portable power when and wherever you need it.